Teeth are a relatively small part of the human body, but they are extremely important. Not only do they help you to chew food, but they also help you speak clearly and smile with confidence. But what if your teeth aren’t living up to their potential? You may want to consider getting dentures in Bloomfield Hills. Forget all the negative talk you might have heard about them; these prosthetic teeth are perfect for many people. If any of the following are true of you, we encourage you to talk to your dentist about dentures. Several tooth replacement methods are available, but dentures are among the most affordable. And don’t think that they’re just for replacing an entire arch of pearly whites. Your dentist in Bloomfield Hills can design a partial denture, a single prosthetic that fits around your existing natural teeth and fills in the gaps. By replacing your missing teeth, you can experience several oral health benefits. For example, the dentures can help to prevent your natural teeth from shifting out of place. Implant-supported dentures (which are anchored in the mouth via small titanium posts in the jaw) even have the ability to prevent the bone loss that occurs with tooth loss. Whether it’s due to genetics, trauma, or years of bad habits, you may have some severe problems with your natural teeth. Your dentist may be able to repair them, but in some cases, extraction is necessary in order to relieve your pain and preserve your oral health. Other conditions, such as gum disease, can also lead to the need for extractions. After the extractions, your dentist can fit you for a sturdy, natural-looking denture. While it’s still vital to keep your dentures and your mouth clean, you’ll never have to worry that decay will wreck your new teeth! Teeth play an important role in your appearance; without them, your face may appear sunken. You may even hesitate to smile or laugh because of your missing teeth. Dentures that are made of high-quality materials can look extremely natural, allowing you to smile, speak, and eat with the confidence that you’ve been missing. 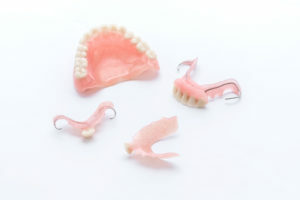 Don’t worry about the horror stories you may have heard about dentures slipping out. If your prosthesis fits well, you shouldn’t experience any such problems. The key to maintaining the fit of your new teeth is to visit your dentist regularly so they can make necessary adjustments to your denture. Are you a good candidate for dentures? If you have missing teeth and you’re ready to regain your smile, the answer is probably yes! Dr. David Banda has extensive training in restorative dentistry, including dental implants and prosthetics. He truly enjoys rebuilding his patients’ smiles so they can gain improved oral health and greater self-confidence. If you would like to talk to him or one of our other oral health experts about how you can enjoy a restored smile, please contact our office at 248-647-5434.
by: Dr. David Banda at June 6, 2018 .